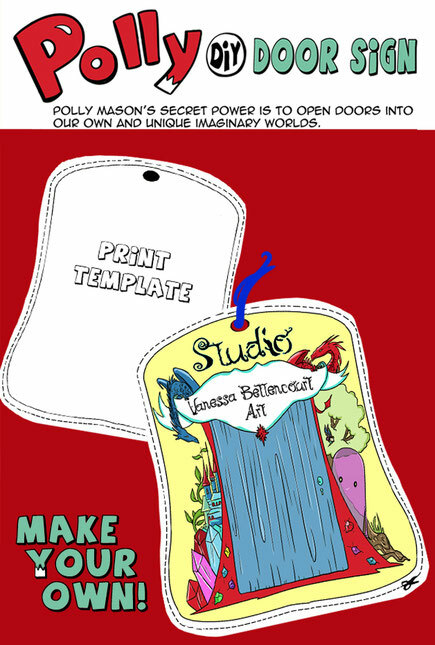 Polly Mason has a secret. She can see people turning grey and the world crumbling as the Black Ink takes over. Her superpower it to find our door on The Other Side and enter our imaginary worlds. She visits our personality, finds the core and protects it from the Black Ink with magic crayons, explosive marbles and glowing gems. To open the door she needs a key. Something that she can borrow. What is your key? Your favorite plushie? A game piece? A cookie? And what does your door look like? Covered with flowers? Covered in chocolate? Made out of foam or shells? Make your own door and share it with us. Polly can't wait to visit your world.